It all began at 3:10 Central Daylight Time. What followed was seven hours and 37 minutes of heart-thumping, chest-clutching, blood-pressure-elevating win-or-go-home baseball. When it was all over, the New York Yankees had finished off the one-time World Series favorite Cleveland Indians and the Washington Nationals held off the defending World Series Champion Chicago Cubs for one more night, forcing a winner-take-all game five in Washington, DC. Such is the tyranny of the five game series. It was only this past Monday that the AL top-seed was the favorite to win the ALDS, ALCS and World Series. It took only 96 hours, but the Indians' chances of ending their World Series drought, now the longest in baseball, plummeted from 30% to nothing. Rising to take their place were the New York Yankees, now slightly favored ahead of the Astros to win the AL Pennant and just barely trailing the Los Angeles Dodgers for the best shot at taking home the Commissioner's Trophy. 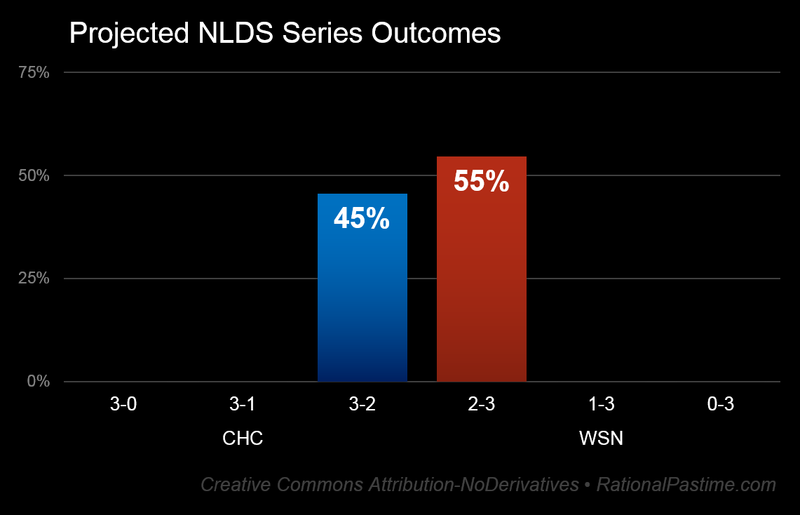 As for tonight, my model has the Nationals favored over the Cubs due to Washington's slightly better RPScore and their home field advantage. It's worth noting, however, that these are crude ratings that do not take into account starting pitching. Models that do take pitching and lineups into account, like FiveThirtyEight's, have the Nats as a narrower favorite at 52%. 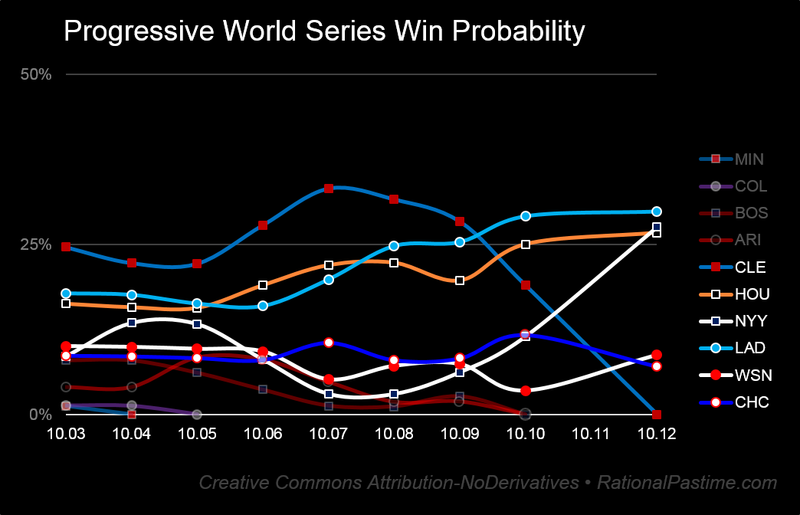 Even narrower are the betting markets, which are theoretically more accurate. At post time, Pinnacle was selling the Cubs at 1.952 and the Nats at 1.97 (British-style decimal odds), implying a 50.2% advantage for Chicago; Bovada was offering the same money line for both teams, implying a 50/50 split. 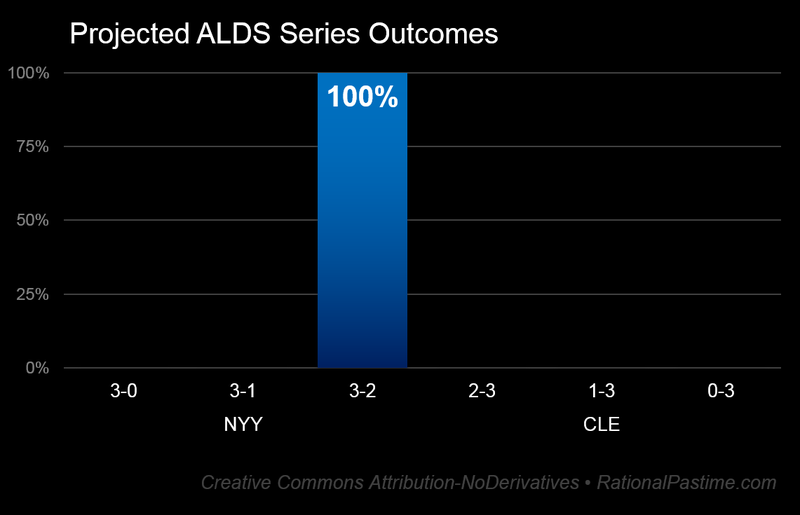 A New York victory over Cleveland in five games was the fourth most likely outcome out of six according to my system, with a pre-series likelihood of 16%. 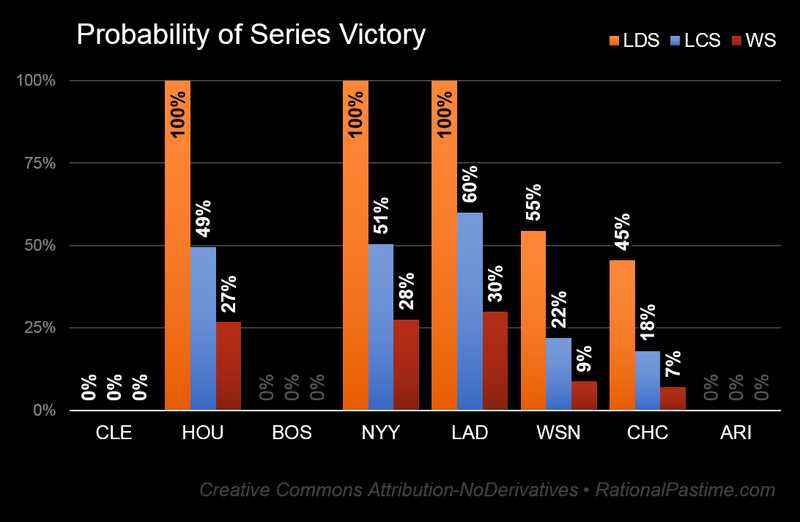 The most likely discrete World Series outcome is a Dodgers victory over the Yankees in seven games, generating millions in television revenues and most likely a bi-coastal civil war. There's one more game left in the NLDS before we move straight on into LCS play. What will the Cubs' odds be if they move on? The Nats'? Their opponents'? Check back tomorrow to find out.